Peer assessment is simply a matter of students giving informed feedback to one another on an assignment. Effective peer assessment is related to clear standards and is supported by a constructive process of critique. Peer assessment is a valuable tool because feedback from peers can be delivered with more immediacy and in greater volume than teacher feedback. Peer assessment should happen during the learning process, on works-in-progress, and be followed by opportunities for students to use the feedback they received to revise their work. WHAT IS NOT PEER ASSESSMENT? Peer assessment is not a process by which peers determine grades for one another. Although some teachers have had success with peer grading, turning peer assessment into peer evaluation is risky and may lead to negative attitudes toward the peer assessment process. In general, peers provide feedback; teachers provide grades. 1. DETERMINE THE CRITERIA ON WHICH THE ASSIGNMENT WILL BE ASSESSED (WHAT COUNTS). This can be done by the teacher alone, or preferably by co-constructing a checklist or rubric with students. 2. THE TEACHER GROUPS STUDENTS INTO SMALL PEER FEEDBACK GROUPS. Two to four students can be grouped based on ability level. 4. STUDENTS RECEIVE A CHECKLIST OR DOCUMENT THAT REMINDS THEM HOW TO DELIVER EFFECTIVE PEER FEEDBACK. The Ladder of Feedback is a good choice of a checklist for students to use as a quick reference. 5. THE TEACHER CLARIFIES THE ASSIGNMENT FOR THE STUDENTS. Clarification includes performance to be peer assessed and the timeline for that assessment. 6. THE TEACHER ACTIVELY MONITORS THE PROGRESS OF THE PEER FEEDBACK GROUPS. Students will need a lot of support when they are first introduced to peer assessment, and less as they become accustomed to it. 7. THE TEACHER MONITORS THE QUALITY OF FEEDBACK. 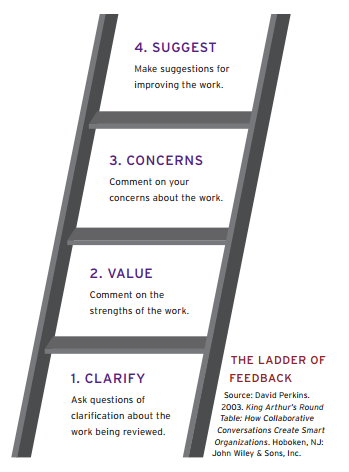 The teacher ensures that her students are using the constructive feedback protocol (possibly the Ladder of Feedback). 8. PEER FEEDBACK IS CHECKED FOR RELIABILITY. The teacher may compare her feedback on an assignment with a student’s feedback to check for alignment and provide further support and instruction if needed. 9. THE TEACHER PROVIDES FEEDBACK TO STUDENTS ON THE EFFECTIVENESS OF THEIR PEER ASSESSMENT. 10. AFTER STUDENTS HAVE GENERATED EFFECTIVE PEER FEEDBACK, IT SHOULD BE USED TO GUIDE STUDENT REVISIONS OF WORKS-IN-PROGRESS. 1. Ask clarifying questions they have about the work. Some ideas may seem unclear, or information may be missing. This step helps peers gather relevant information before they give feedback. 2. State what they value, or comment on the strengths of the work. Expressing appreciation for ideas is fundamental to the process of constructive feedback. Stressing the positive points of the work sets a supportive tone during the feedback session, and helps people to identify strengths in their work they might not have recognized otherwise. 3. Raise any concerns they may have about the work. During this step, honest thoughts and concerns are raised in a constructive, non-threatening way. “What I wonder about is . . .” and “Have you considered . . .” are examples of how concerns may be framed. 4. Make suggestions about how the work could be improved. Give suggestions, based on problems identified in the concerns step, that can help the student use the feedback to revise his work and make improvements. There is no guarantee the learner will use the suggestions, nor need there be a guarantee. Suggestions are just that—suggestions, not mandates. "Kind, thoughtful and effective feedback"